Kale, scientific name Brassica oleracea acephala, is a form of cabbage that is purple or green in color. Its central leaves do not form a head. 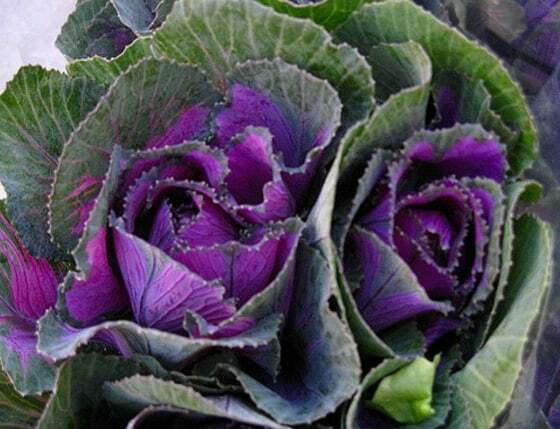 It is also called Borecole, and is considered to be the closest domesticated form to wild cabbage. Brassica oleracea is comprised of several vegetables that include cauliflower plants, broccoli, and Brussels sprouts. The cultivar of the Acephala group also includes collard greens as well as spring greens that are genetically similar. Kale is primarily a biennial plant, which is normally grown as an annual by gardeners. Its leaves are very similar to cabbage. 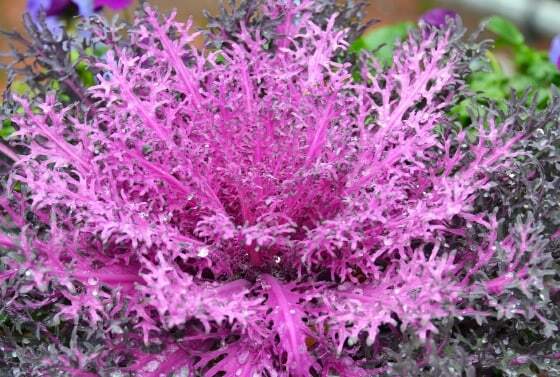 This vegetable has two common varieties: Scotch kale and the Siberian kale. The scotch kale has curly and crumpled gray to green leaves; while the Siberian kale, also known as blue kale, has a bluer shade of green and not-so-curly leaves. Other variants (with time to harvest season) include Blue Knight (55 days, hybrid); Blue Armor (45-75 days, hybrid); Dwarf Blue Curled (55 days); Blue Curled Scotch (65 days); Red Russian (40-60 days); Dwarf Blue Scotch (55 days); Squire (60 days); Dwarf Green Curled (60 days); Winterbor (60-65 days, hybrid); Verdura (60 days); Konserva (60 days); Greenpeace (65 days); Dwarf Siberian (65 days); and Hanover Late Seedling (68 days). Kale is one of the most nutritious leafy greens as it is filled with vitamins and minerals: a a single cup of boiled kale (67g) provides 1328% of Vitamin K, 354% of Vitamin A, and 139% of Vitamin C needs. It is also a great source of magnesium, folate, thiamin, and riboflavin while being naturally low in sodium and fat. Although this biennial plant does not grow fairly well in hot seasons, it can still be grown all year-round indoors and in optimal climates. Kale is a fast growing low maintenance plant that typically reaches from 1.5 to 3 feet (45 – 90 cm) in height, with a spread of 1 to 3 feet (30 – 90 cm). It is cold hardy, and can even be harvested in the snow. Foliage is from light to dark green, red, or purple, with the texture ranging from fine to coarse. Plants are upright and may grow as cushions, clumps or mounds. In addition to being used as a food plant, many varieties of Kale have been produced to be used ornamentally. Choose a location that has full sun, although kale can also tolerate partial shade in warm locations, and that has a well-drained soil. The pH of the soil should be between 5.5 to 7.5. It is best to grow this leafy green in cool weather to get optimal flavor. Soil preparation should be conducted two to three weeks before planting and sufficient amount of aged compost should be added. Soil should be well-fertilized and kept moist, otherwise the crops may taste too bitter and become unusable. Kale is a cool-weather crop that can be grown in temperatures as low as 20°F (–7°C). It does not tolerate heat so is best planted in early spring in cool-summer regions (start indoors and transplant well before the last frost; see below). It can also be sown directly about three months before the first frost of autumn. Seeds germinate at temperatures of 40 to 85°F (5 – 29°C), emerging after 4 to 7 days. Kale can be sown directly into the garden bed but can also be started indoors, especially when grown from seed for spring harvests. Sow the seeds under ¼ to ½ an inch (6 – 12 mm) of soil, approximately eight to nine weeks before the average last frost date. Ensure that the seeds are sown in an area getting sufficient sunlight otherwise they may get “leggy” or become spindly. Thin out to 12 to 18 inches (30 – 45 cm) in rows spaced at about 18 to 30 inches (45 to 90 cm). The seedlings can be transplanted in the garden beds three weeks after sowing –six weeks prior to the average last frost date (a frost greatly enhances Kale flavor). When transplanted, initially, dig up the soil and if needed, add aged manure or aged compost to prepare the area. Transplanted seedlings should be spaced 20 to 24 inches (50 – 60 cm) apart to prevent Kale plants from being too crowded. 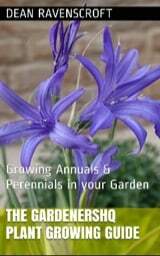 If plants have grown long stems when started off indoors, then dig lower and plant the lower stem underground. This can be done by right up to the lowest set of leaves; this will enable the plants develop a more sturdy shape. For best germination use seeds no older than four years and keep the soil moist. Another batch of seeds can be planted two to three months before the first frost, to have a fall crop of kale. Always keep plants well fertilized and watered as this prevents leaves from getting too tough and allows sustained growth. Adding aged compost to the garden bed two to three weeks in advance of transplanting is beneficial, as is providing a side dress with aged compost every six weeks. Kale care ideally involves planting alongside companion plants such as potatoes, herbs, beets, and onions. Do not plant near tomatoes, strawberries, or pole beans. Since soil can easily stick to the plant's crinkled leaves, mound straw around them when they have reached six inches (15 cm) high as this will prevent the kale from touching the soil. Kale is susceptible to attack from cabbage loopers, cutworms, and cabbage worms. These can be controlled by spraying with Bacillus thuringiensis or simply hand-picking off the worms. Aside from the above mentioned pests, there are no really serious diseases or problems with kale. In general, early infestation from insects is best prevented in members of the cabbage family by using floating row covers. Though quite hardy to disease it can be affected by Alternaria, Black leg, Black rot, and Clubroot; rotating the location where Kale (and similar species) grows in a three-year cycle will prove beneficial. Kale is expected to be ready for harvest about 55 days after transplanting, or around 70 to 80 days from sowing seeds directly. When the plant reaches eight to ten inches (20 – 25 cm) high, cut individual leaves for use by cutting the outer leaves first. Harvest kale before its gets tough and old. When harvesting the entire plant, cut two inches above the ground, this will allow the plant to sprout new leaves in one to two weeks' time. Kale can be kept in the refrigerator for one to two weeks in a sealed plastic bag. It can also be dried, canned, or frozen.